Twice a year, once in May, and once in October, there is the obligatory discussion on the theme of the semi-annual LDS general conference. The importance of a conference of this type is that each person can take away key principles that will help improve their lives and that is the theme for them. It is not the overwhelming theme of the conference but it is often referenced. 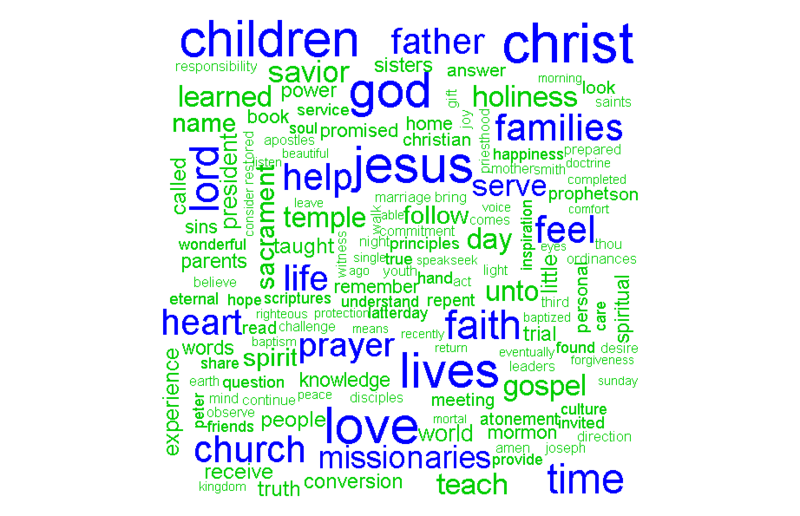 Other topics that frequently appear include missionaries and children. I took every word from all talks during the conference (excluding the statistical report, Priesthood, and Relief Society sessions) and analyzed the data. I took two approaches. The first was a simple straight forward summary of word frequency. This ends up becoming a word cloud. Though, personally, it’s not my favorite graph to present data the word cloud tends to be fan-favorite and, if anything, it is a fun way to visualize data. The second approach is solidly statistical based and uses Latent Dirichlet Allocation. This is effectively a way to cluster the text spoken during the conference into a bunch of bag of words (that is a technical term). Those bags contain specified words with a probability. For those familiar with the Dirichlet distribution you will note that it is the conjugate prior of the categorical distribution. This means that I can group the words spoken into topics (themes) and each of the groups will contain specified terms (words). So there it is. This is my quick analysis of the October 2012 General Conference and the theme of the conference. However, I think the one thing that people will remember from this conference is missionary work. *Note: For those that care all analyses used R.